The standard fuel gauge on a Monsun was a wooden stick (I still have mine), about 115 cm long and 10 mm by 12 mm thick. It has a mark for 25 liter, 50 liter and 75 liter at 24.2 cm, 40.8 cm and 54.5 cm respectively from the bottom end. This stick was put down as far as possible in the bronze T-valve in the filling tube just behind the engine in the bottom of the engine room, after removing the bronze cap. Standard, the Monsun never had any other devices installed to measure fuel level. The tool used for manual reading of the diesel fuel tank is home-made. 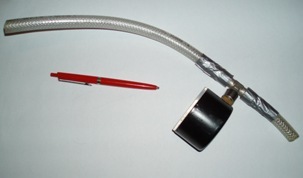 It consists of a common low pressure gauge (WIKA, see pdf-45kB) with a range of approximately 0-6000 Pa (0-60 mbar), hooked to a T-connection on which a 14-mm outer diameter (8-mm inner diameter) plastic pressure hose is fitted. One piece below the pressure gauge of 100 mm length (4 inches), and one piece going up from the pressure gauge, with a length of 20-30 cm (8-10 inches). The gauge is connected to the dieseltank evacuation tubing that sits inside the port bench stowage room in the cockpit, and goes down in the bottom of the diesel fuel tank. 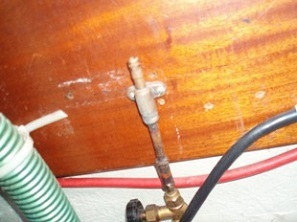 This tubing is made of copper and is generally used to remove water and gunk from the bottom of the dieseltank. 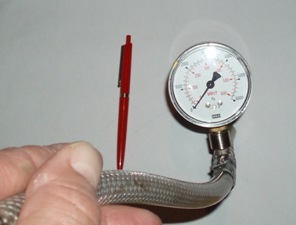 Then you blow with your mouth into the plastic tubing going up, while looking at the pressure needle. Continue to blow harder until you see the needle in the gauge starting to vibrate. That is the pressure to note down. This vibrating needle is caused by the air escaping through the diesel fuel column. Now you have a value to compare with a callibration diagram that you have made especially for your tank. 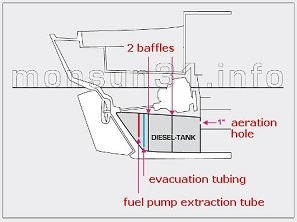 Note that due to deposits of gunk in the bottom of the diesel fueltank, no Monsun tank volume is exactly like other Monsun tanks. So you have to make your own callibration. Callibrate your tank by filling 10-15 liters diesel at a time, then reading the pressure from your home-made gauge. Write that down. Do this until you have a full tank. 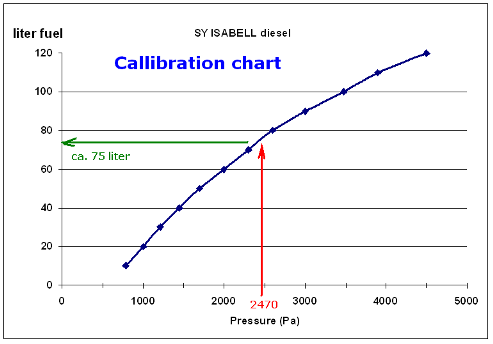 The fuel callibration chart of SY Isabell for reading the approximate content of the main diesel fuel tank. Note that the line is not straight, this is due to the fuel tank not being the same form all the way up inside. So who needs a high-tech electronic gauge or an in-tank device that sooner or later will clog up and will stop working? This works fine, and always!! !